New tweaks extend the CS100’s range 140 nm. Bombardier has managed to squeeze another 140 nautical miles of range out of the C Series CS100 on flights to and from London City Airport (LCY), allowing the new narrowbody to fly 2,350 nautical miles with a full 108-seat passenger load. Speaking Wednesday at Bombardier’s Farnborough Pavilion, C Series program head Rob Dewar explained that modifications to the flight control system and software now give the C Series about twice the range of the Avro RJ85, enough to connect London and Moscow nonstop. It will also allow for direct service to JFK in a 42-passenger configuration. British Airways’ Airbus A318 flies 36 passengers on that route with a stop in Shannon, Ireland, for refueling. Steep takeoff and approach requirements at London City call for a 5.5 degree glideslope, and Bombardier must test and validate the C Series to 8.5 degrees to qualify to operate there. It has completed the associated development tests in Canada and has started the process of performing software validation integration. 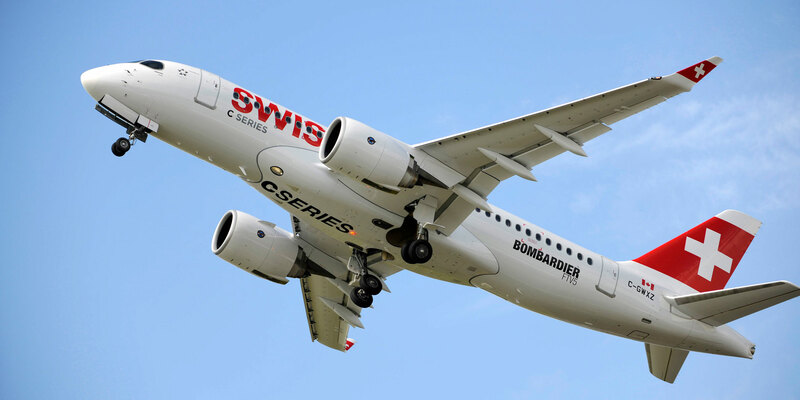 Plans call for certification “later this year,” in time to meet Bombardier’s commitments to launch customer Swiss International Airlines, which plans to start LCY operations to Zurich and Geneva next year. London City Airport CEO Declan Collier explained that the C Series will help LCY support accelerating growth by offering airlines 25 percent more capacity while using the same number of takeoff and landing slots. Meanwhile, the expanded C Series range will open direct connectivity eastward from London to the Middle Eastern Gulf states and Turkey and westward to New York JFK Airport, Toronto, Montreal, Boston and Chicago. Bombardier estimates the C Series could fly between LCY and Dubai direct with 80 passengers on board. The Canadian Airframer has a broad presence here at the Farnborough Airshow, in Hall 1 (Stands 101 and 111), Chalet C3, and Outdoor Exhibits 24 and 26.